We weren’t entirely sure where we wanted to spend our next night. 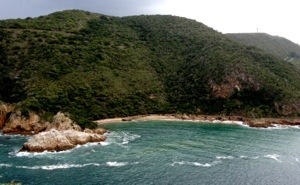 Originally we had thought Knysna, until Sam told us it wasn’t worth out while. 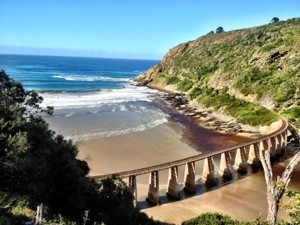 Then, when we stayed an extra night in J-Bay, we tried to include as many sights as we could in a single day. We aimed for a little town near George called Wilderness. Why not? It was quite a ways down the road, it had a cool name, and we’d heard it was a pretty laid back beach village. Sounds good to us! For the first part of our trip it was still raining. 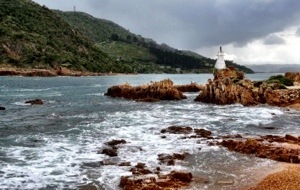 We stopped in Storms River for lunch, but the town didn’t have much for people stopping by. We had opted out of the bungee jumping (the largest bridge jump in the world at 216m) to save money for several other must-do activities along the way: plus after the gorge swing I’d had enough of hurling myself off huge heights. The garden route was lovely, but the misty rains made it hard to see things, and the side roads to Nature’s Valley was sadly closed. 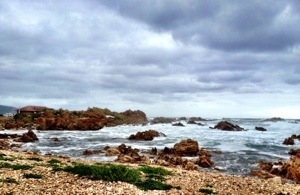 Fortunately, by the time we hit Plettenberg, the clouds lifted and the rains stopped. 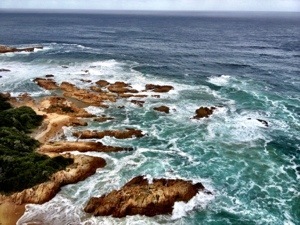 Plettenberg was adorable. The whole town was built on a hill, overlooking the ocean. The locals walked around the street barefoot, and everyone seemed friendly and in good spirits. We wandered around a little craft market, then made our way down to the shoreline. The waves were gorgeous, the sky had brightened and we were in heaven! It was hard to leave, but finally we made our way to Knysna. 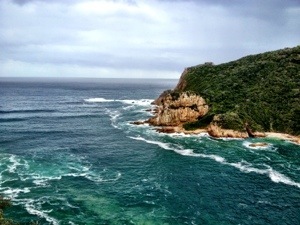 We drove through Knysna to “The Heads” which had some incredible views of the coastline. 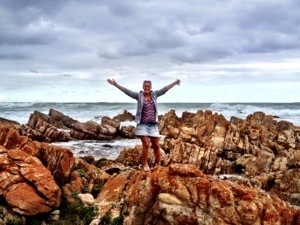 I don’t know what Sam was talking about; Knysna was beautiful! The cliff sides and splashing water was absolutely stunning to look at. We found more than one view point and spent forever just taking photos from every angle we could find. On the other side of the water passage, there we all sorts of hiking paths and caves to explore. If only we had more time, and if Kelsi could walk without a limp, we could have spent hours exploring the area. We drove back down to the bottom of the cliffs to see the water up close. Right along the shoreline was a beautiful little restaurant that served wine and seafood. One of our goals along the way was to sit and eat oysters and sip on wine somewhere along the coast. Unfortunately, this place was too classy and too expensive for our tastes, so we got back in the car to search somewhere else. We did a quick drive through of Knysna’s busy restaurant area, then carried on to find a place called Buffalo Bay. We were all about pulling off route to find small corners of the earth, untouched by tourism. Buffalo Bay was the first of those places that we’d found. Just a little ways away from Knysna, Buffalo Bay (or Buffels Baai as the signs show) it a tiny town with some outstanding shoreline. Fisherman fished off the rocky shores and the sun and clouds made for an awesome photo op. we didn’t spend much time in the town, as the day was getting late and we still had to find a place to stay. So we hopped back in the car and continued back along the N2. Just a little ways along the highway there was a turn off to a community called Timberlake. Hardly a community really, it was just a small village with about 10 buildings that considered itself an “organic community”. I made some lame Justin Timberlake joke and looked back at the town as we drove by. Kelsi pulled a U-Turn and we flew down into Timberlake. It was the best U-Turn I’ve ever made. I can’t even find a word in my vocabulary for how much I liked Timberlake. There’s really no reason for me to have loved it so much, it was ten or so little wooden buildings that sold organic goods from around the area. Honey, wine, cheese, cured meats, and there was also a beautiful looking restaurant… Then there was the Oyster Shack. Just a little bamboo and wooden shack, with a tiny bar, some killer tunes and wandering chickens. Yup, there were chickens in the bar. 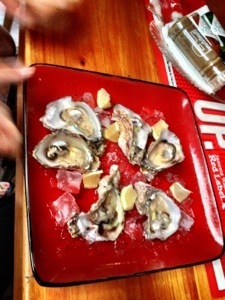 On top of that, they sold very cheap, entirely organic oysters and amazing local wines. Win! We sat down at the bar and met Dominique, the owner and bartender and one of the most pleasant people I’ve ever met. “How did you find this place?” He asked us. He laughed and asked us if he could get us anything. We ordered some oysters, I got a glass of wine, and Kelsi sipped on a cider. Then we hung out and chatted to Dominique about our travels. The oysters were incredible, and the wine was my favourite of the trip. Dominique was super helpful and suggested a couple places in town to stay for the night (along with directions). He asked us if we could do him a favour and send him post cards from India and Canada and New Zealand. He wanted to be able to post post cards up on the wall of the shack from around the world, but sadly only 2 people had remembered and his collection was lacking. We promised him we would, and in turn he offered us some shots on the house. Kelsi was driving so we said nothing strong. He suggested we try this new type of liqueur that just came out on the market 3 weeks ago. It was called Black Moon and was peanut butter flavoured. We figured we’d try it out, not expecting much, so he poured us a round. It was out of this world amazing! I couldn’t believe it! It was the perfect combination of sweet and salty and one of the best shooters I’ve ever had (which, let’s face it, is saying something). I have searched long and hard for that liqueur ever since and have unfortunately not come across it. So sad. When drinks were finished, we said goodbye and continued the 10km to Wilderness. We pulled up at the hostel Dominique had recommended and was greeted by the owner who was in a frenzy! Her face was genuinely upset. ” oh I’m so sorry ladies, I’m so full! I have people sleeping on my couch at home, and I’ve given out all my tents! I can’t think of a single place to put you!” She turned to me and gave me a big hug. “I’m so sorry love.” Then she turned to Kelsi and gave her a huge embrace as well. “Look,” she said, determined not to let us down “ill call the hotel down the street and see if they will give it to you at hostel price” she did, but they wouldn’t budge on their offer. “Sometimes I don’t know how people like that can run a business!” She exclaimed. Then she gave us directions to a hostel on the other side of town and asked us to come back for dinner if we could. Oh my god, how nice is everyone in South Africa?! We made it to the next hostel by dark, and the old man who ran the place was just as pleasant. He talked on and on about all the wonderful places to see in Wilderness ( he obviously took great pride in the town) and gave us some restaurant suggestions as well. When we were shown our room, we decided to head to a local restaurant called Cocomo. They had an incredible seafood platter and amazing live music. He band playing was called Wild Lettuce, and had some of the most unique sounds I’ve heard in a while. The two guys playing were so amazing, Kelsi and I each bought one of their CD’s. It had been another long day on the road but it was wonderful. The scenery, the people, the food: it was in Wilderness that I decided South Africa was my favourite of all the countries I’ve visited. Yup, for a person who NEVER chooses favourites, this was a big milestone. Next stop: Oudtshoorn for a second glance! 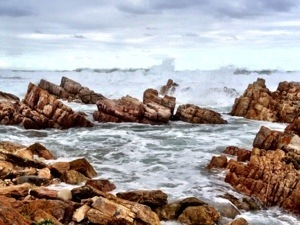 This entry was posted in Africa, South Africa and tagged beach, beautiful coastline, oysters, South Africa, Wilderness by hilarylust. Bookmark the permalink.